Along with her husband, Lee Childress started the awards in 1969 that recognize outstanding talent in high school musical theater. Lee Childress, a fixture of the arts community who nurtured generations of high school students, died Friday at Mission Hospital in Mission Viejo, near her home in Laguna Woods. She was 95. 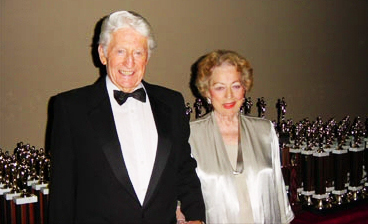 Remembered as warm, giving and “a bit of a diva,” Childress co-founded the MACY Awards with her husband, John Childress, who died in 2005. The MACYs, or Music and Arts Commendations for Youth, which were renamed the Childress MACY Awards a couple years ago, recognize achievement in high school musical theater and are presented to hundreds of students at a ceremony each May. The MACYs are the nation’s longest-running awards program for high school theater, according to program director and board Vice President Carole Zelinger. Childress co-founded the organization in 1969, after one of John Childress’ former students convinced the couple to attend a performance of “Flower Drum Song.” John was a high school principal and sports coach, while Lee worked as an actress and a philanthropist. “They went, and they didn’t want to go,” Zelinger said of that first show. Both were so moved by the student’s performance, Zelinger said, that they decided to start a program for honoring students in musical theater — despite that at the time, most praise being reserved for athletics. The program has grown to include more than 40 shows at about 30 schools, mostly in Orange County. Last year, the awards ceremony was at Segerstrom Center for the Arts for the first time. “That’s sort of a crazy feat — the amount of shows [Lee saw] every year,” said Brian Johnson, a drama teacher at La Habra High School. Johnson said that winning a best actor MACY in 2000 and becoming close to Childress inspired his career. “The tree behind her went up and took her dress with it,” Odenkirk said. “She told [students] they can never expect life to be 100%” as planned. As for Childress’ favorite musical? “I bet that would be her favorite, ‘The Music Man,'” Odenkirk said. Childress is survived by her daughter, Cathe Drino, and two granddaughters. A memorial will be at 7 p.m. Oct. 9 at Geneva Presbyterian Church, 24301 El Toro Road, Laguna Woods.